Within a very short distance from the mountains the landscape begins to change – although the altitude is still high – as you move to a drier environment. We arrived at Mesa Verde National Park only around an hour before sunset so we went straight to the campground here and settled in for the night. First thing in the morning we drove the 20 miles to the Visitor centre. 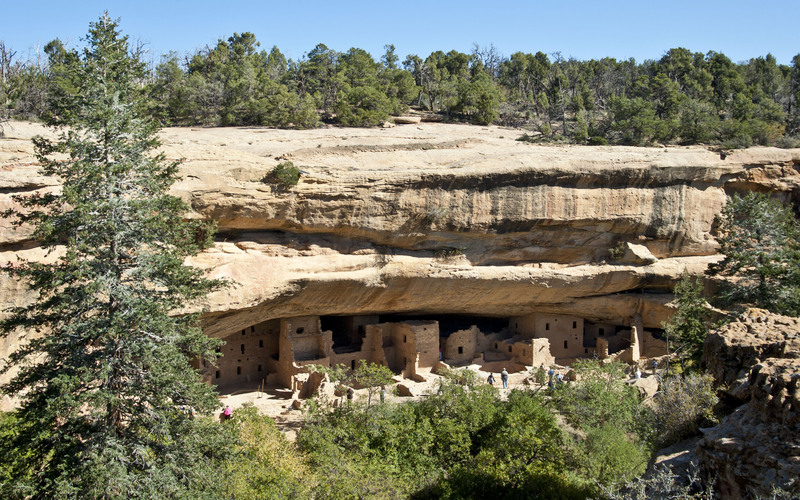 In order to visit the main two sets of ruins at Mesa Verde you have to book on a ranger led tour. These can really fill up in high season but fortunately for us we booked on tours quickly and easily. The cost of each tour was only $3 which seems really good value. In the summer there is also a third set of ruins to visit but the road to the second Mesa which these are on had been shut for the winter. 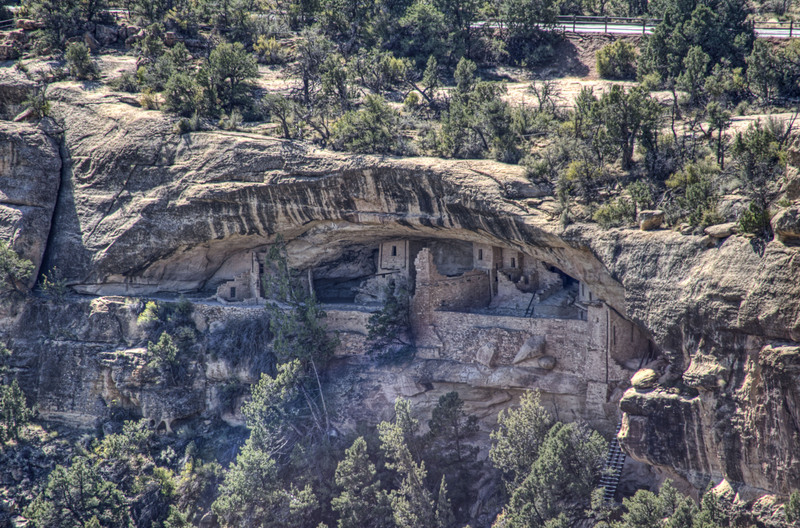 The ruins at Mesa Verde are from Ancestral Pueblans whose descendants live in the New Mexico region today. For hundreds of years they lived on the Mesa tops farming Corn and Squash however at the start of the 1300’s something prompted them to move from the Mesa tops and build easily defensible dwellings in the cliff walls (possible civil war). They only stayed here until around 1380 when they migrated South – possible due to cooling temperatures causing crop failures. The first site that we visited was Cliff Palace (the biggest and most impressive of the ruins). There was an easy hike both in and out of this site. There is a serious problem here that the foundations are being undermined by a combination of water and rats. The National Park service is wrestling with the technical problems of stabilising the site but they are slightly hamstrung by the wishes of the modern Pueblans who will not let them disturb any of the burial sites in the foundations or use any metal in the fix. The shifting of the walls resulting from these problems has meant that some of the Kivas are no longer perfectly round. 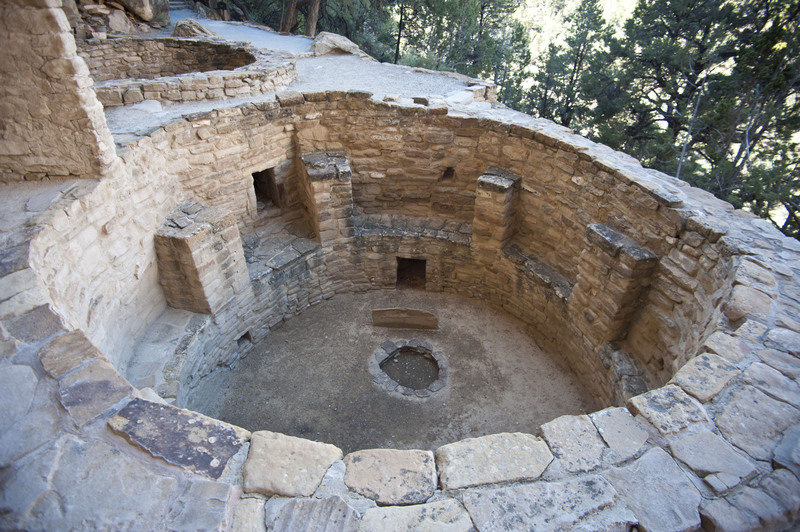 The kivas are the centrepiece of each of the ruins and it seems that each family group had one. 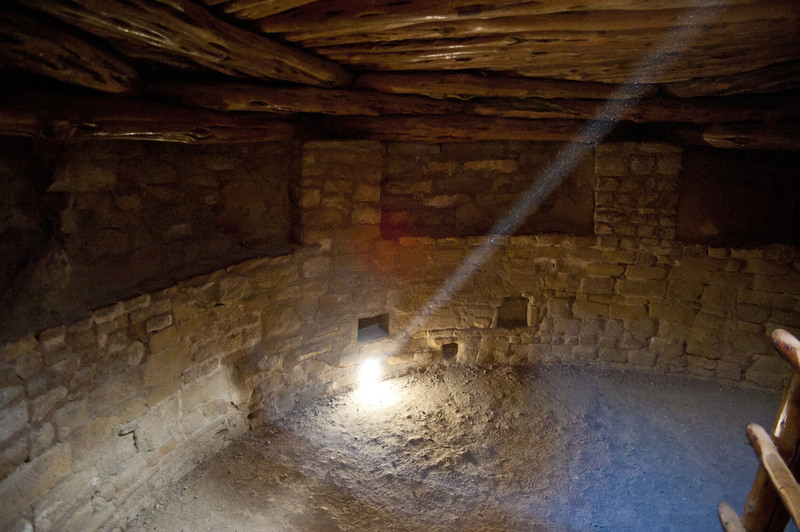 They were used for ceremonies and were the centre of the spiritual lives of the ancient Pueblans. The small stone wall you can see opposite a hole in the wall is to deflect incoming air from the ventilation hole to prevent it going straight to the central fire and allow the air to circulate. 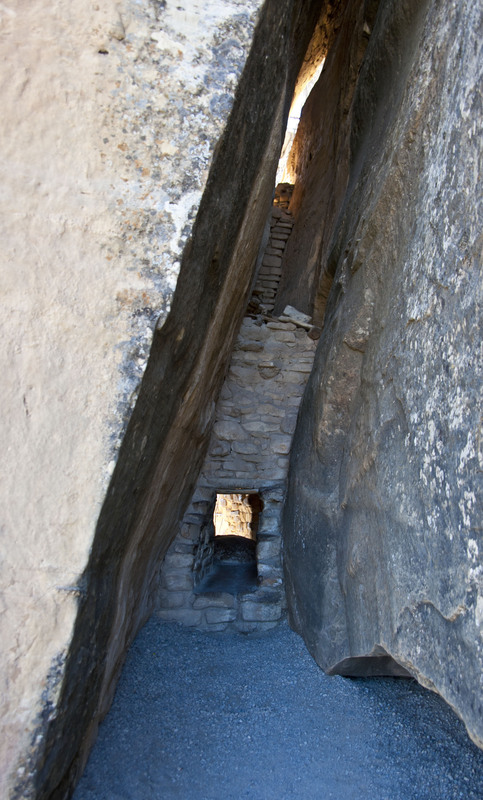 The Kivas would originally all have had thick roofs and these would have been used as highways across the villages. After the tour of Cliff Palace we had to rush around to Balcony House for our tour there. 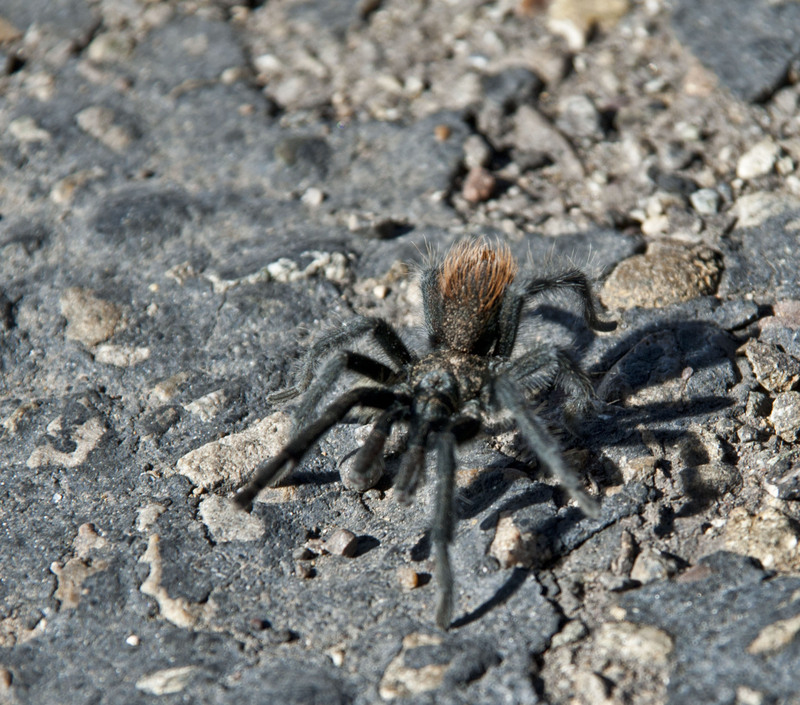 While waiting for the Ranger to arrive we noticed a Tarantula walking across the paving. Sarah was not impressed. The Balcony House is a smaller site than Cliff Palace and is harder to access. A thirty foot ladder must be scaled and then you have to squeeze through a relatively tight passage to get into the area. You can see the ladder that you have to climb up to the site in the bottom right hand corner of the picture. Even worse on the way out there is a tiny little hole to squeeze through and then another ladder to climb. I only just got through the hole and had to push my camera and backpack through before me. Balcony House is notable for its large courtyard space with a guard wall where ceremonial dances would have taken place. After these two tours we visited some of the other accessible sites including Spruce Tree House – which is the only self-guided major ruin in the Park.